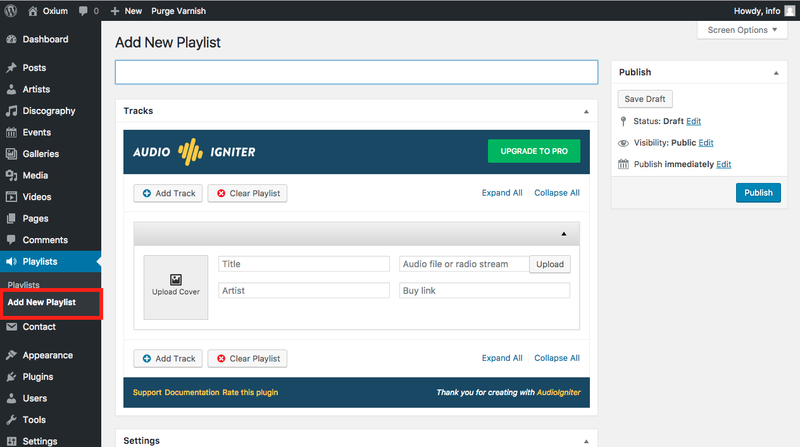 AudioIgniter is a supreme plugin that allows you to easily embed music, create playlist's and much more! Ideal for music website's that want to have that extra something! 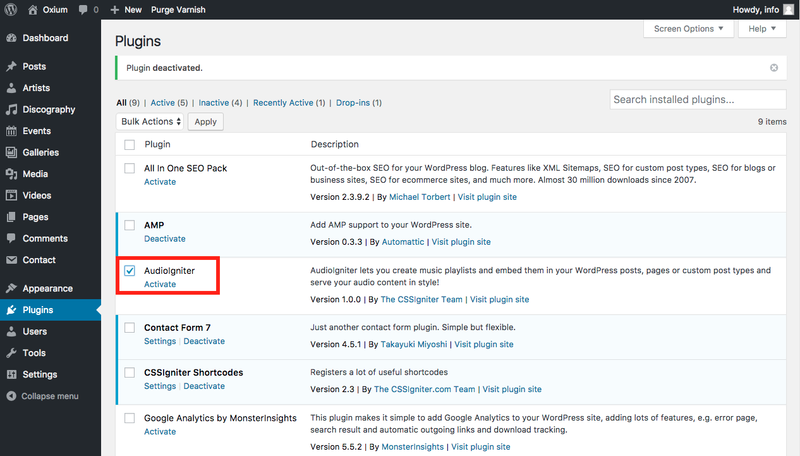 To activate the plugin simply navigate to Plugins in your WordPress dashboard and click Activate. 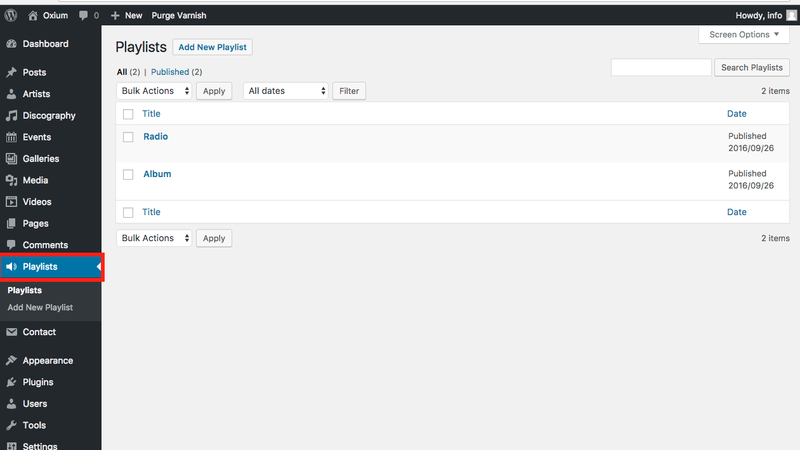 Next a Playlist option will appear on your Dashboard. It provides you with the option to Add New Playlist. Start by giving your playlist a name. A playlist needs music. Let’s have a look on how you can add and remove them. In the image above you can see the Tracks metabox. Below we take a step by step approach on adding a track. Add a cover. Click the placeholder image and WordPress’ media manager will pop-up to allow you to upload a cover or select a preexisting image. 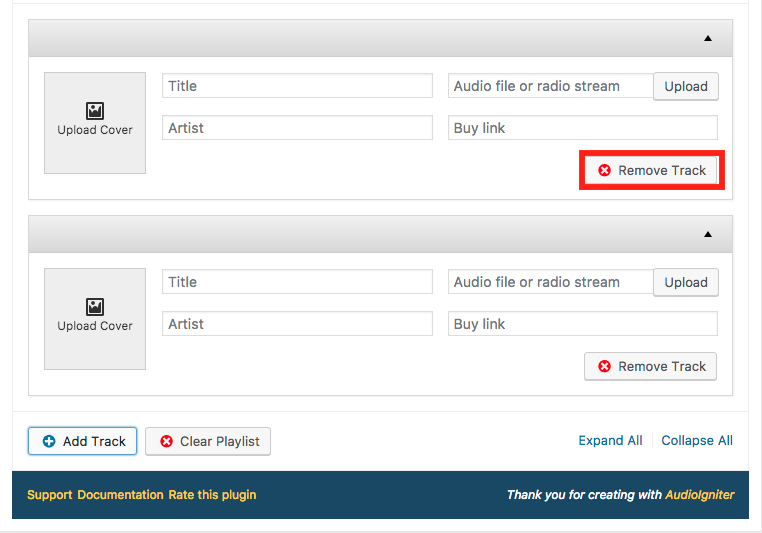 Click the Upload button to get a media manager pop-up which allows you either to upload a new mp3 file or select a preexisting one from your media library. Alternatively if you have a radio stream URL you can paste it in the box. If the track is available for purchase you can paste the URL of the marketplace where your visitors can purchase it. 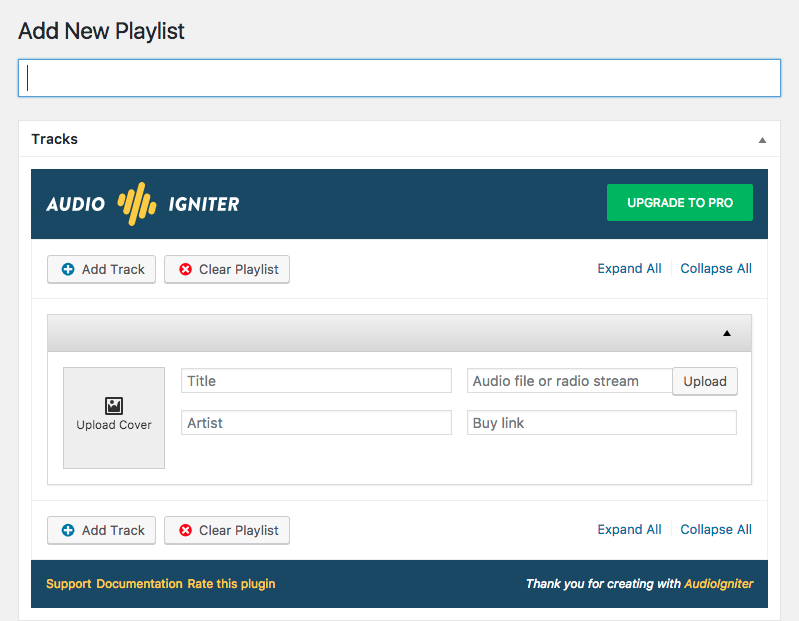 Click the Add Track button, rinse and repeat to add the rest tracks of your playlist. To remove a track simply click the Remove Track button. Notice: You need to have at least two tracks for the remove track button to appear. There are a lot of settings available to help you shape your ideal playlist. In the image below you can have a closer look at them. Show track listing: this option allows you to toggle the appearance of the track listing. Leaving the box un-checked will only display the player. Show track numbers in tracklist: this option toggles the appearance of track-list numbering. Show numbers in reverse order: reverses the number order to allow you to create a “countdown” playlist. Show track covers in tracklist: select whether you want to display track covers in the tracklist. Show active track’s cover: this option allows you to hide the current track’s cover from the player. Show artist names: toggles the appearance of artist names on the player. Show buy link: toggles the appearance of the buy link on the player. Show “Powered by AudioIgniter” link: This allows you to display a powered by link below the playlist. Please consider enabling it. 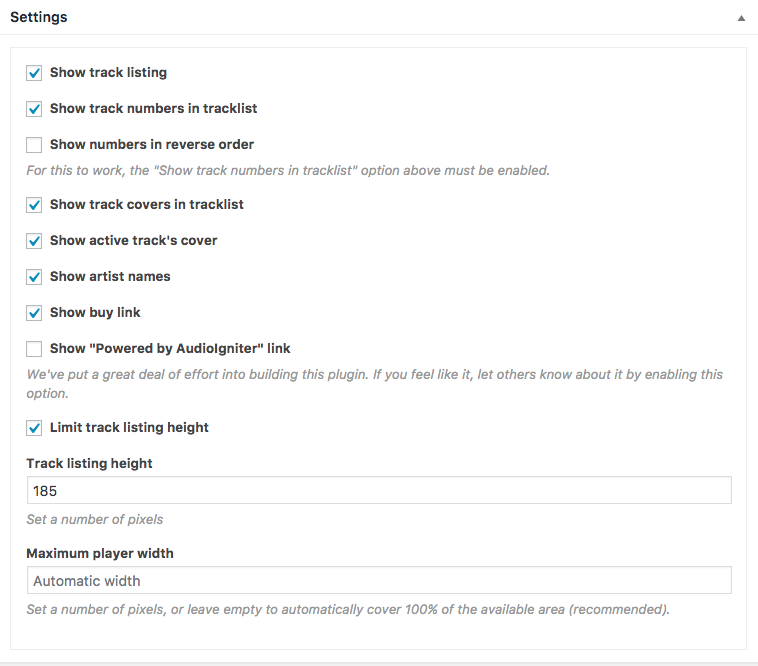 Limit track listing height: Larger playlists will take up a lot of height on the page, to prevent that from happening you can set a fixed height for the list which will enable a scrollbar when the list goes beyond it. Maximum player width: By default the player will take up all the available width, this allows you to set a maximum width for your player if you want to create a specific layout. Once you figure out all the settings you are done with your list creation. Click the Publish button. To display the list you need to grab its shortcode. Paste the shortcode in any post or page and save. You now have your new playlist. TIP: if you want to use the player in a sidebar you can paste the shortcode in a standard textwidget. If you don’t see the player after saving the widget you will need to enable shortcodes in textwidgets.